Accumulators are available for system through 28 tons nominal capacity. 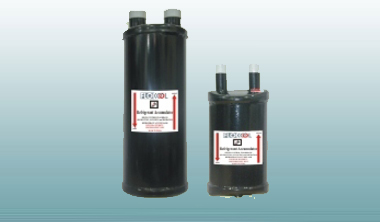 Suction line accumulator for CFC, HCFC & HFC refrigerants. Designed to operate in a range of + 40 Deg F -40 Deg F evaporator temperature. Inlet deflector that blends refrigerants flow to prevent internal splashing and aid in the collection of refrigerants oil in the bottom connection of the accumulator. Ordering Information F K AS.